If you have any questions about the NOAH 76 information page below please contact us. The Catamaran Noah 76 was designed by VPLP naval architects (Van Peteghem Lauriot Prévost), world leader in the racing and cruising multihull sector, with an interior design from Anne-Monique Bonadei. The yacht Noah 76 is a yacht for passionate people who want to be at one with their boat – living and sailing aboard. Life on the yacht Noah 76 is more than anything a concept of unique pleasure and practicality. She is the perfect answer for those wishing to escape the routine of life in the fast lane. Alu Marine Catamaran Noah 76 is a powerful and strong yacht built according to the highest professional standards for ocean cruising. The particularly spacious deck areas, allow the guests to make the most of the fine weather and enjoy the natural surroundings. The low draft is ideal to reach the most inaccessible anchorages. The Noah 76 was developed by VPLP, Van Peteghem Lauriot Prévost, whose naval architectural skills are recognized all over the world. The décor was created by the interior designer Anne Monique Bonadei from Milan. From the exterior, the style is refined and the lines are elegant. Inside, the simple and natural decor creates a peaceful atmosphere. The attention given to finishes and the choice of materials enhance comfort and relaxation on board. Materials and colors are in perfect harmony. 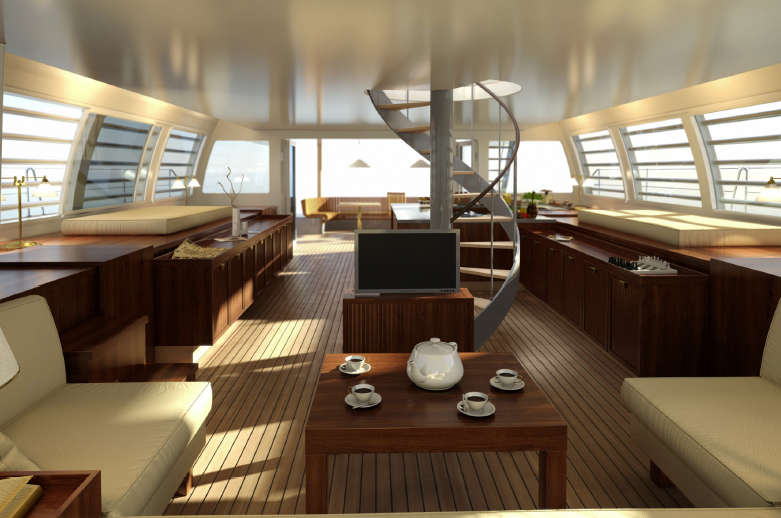 The Noah 76 Yacht offers an impressive living area of 260 m2 / 2800 sq.ft. The headroom, which is quite exceptional everywhere on the yacht, offers optimal comfort for her passengers. Distributed on three levels, the accommodation of this large expedition catamaran is spacious, comfortable and practical. It allows for closeness and intimacy. It is also a very quiet motorboat, perfect for enjoying long peaceful cruises. 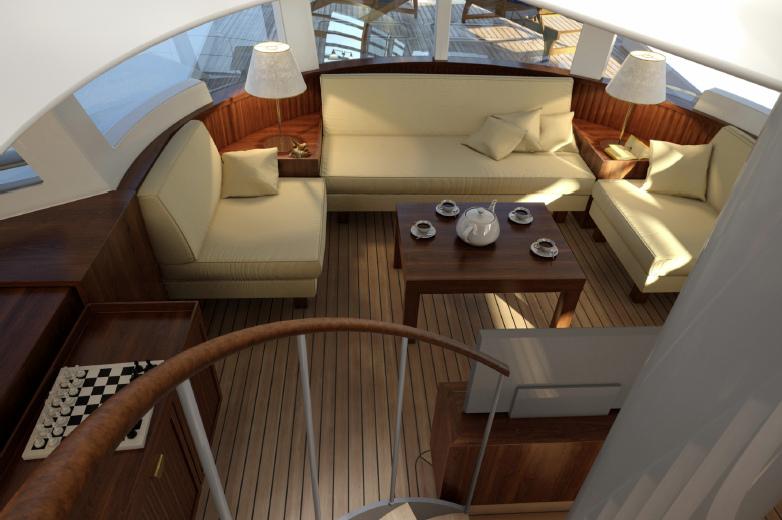 Real “loft” on the water, the spacious saloon, with its large sliding doors opens widely to the outside. The interior is light and airy; it is well ventilated thanks to the large opening windows. 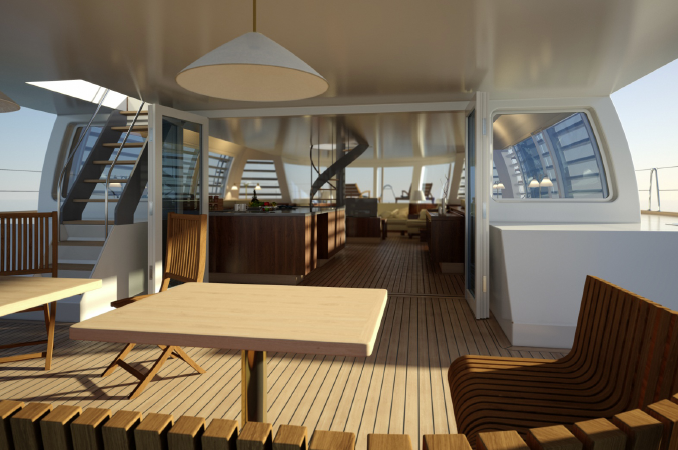 A spacious and friendly galley looks onto the saloon and the outside. 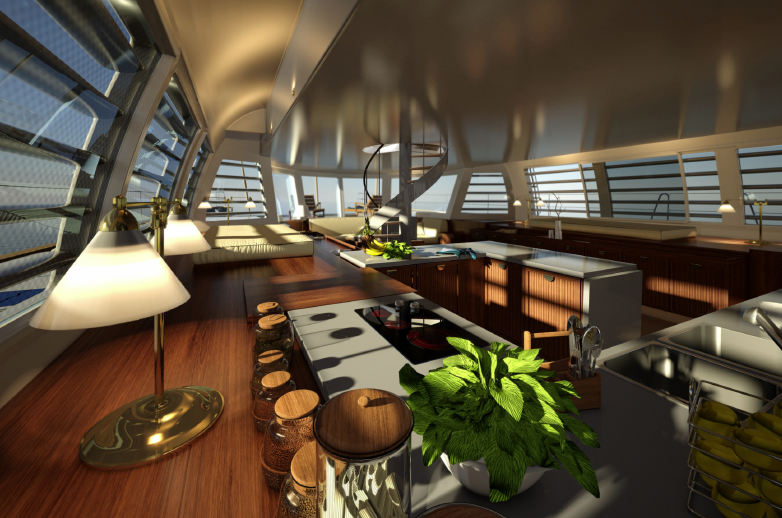 With the generous worktop and simple and uncluttered design, the galley is functional and very pleasant. Outside, there are large living areas with deckchairs and a long table where 12 guests can enjoy a friendly meal. The upper deck is reached from the saloon by a spiral staircase or by an outside staircase from the cockpit. The upper deck comprises a well appointed wheelhouse and a spacious lounge with a sunbathing area to enjoy the sun and the evenings “al fresco”. A sun awning can be added for more comfort and seclusion. 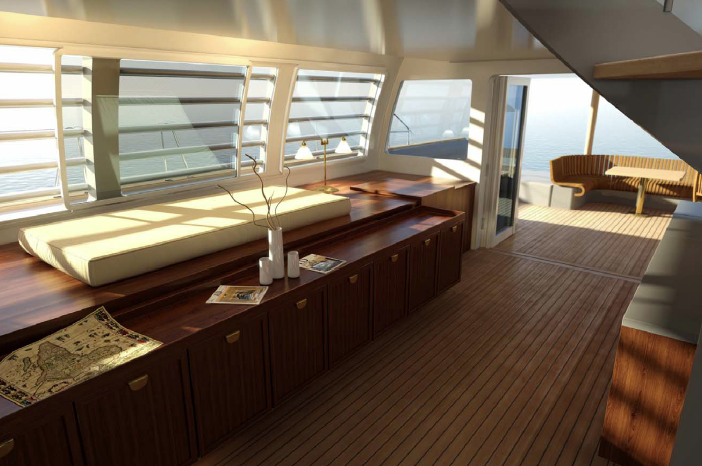 The cabin layout in the hulls provides perfect privacy. Each cabin has a bathroom en suite. For more comfort, the engine rooms have been located as far away from the accommodation as possible and sound and thermal insulation was specially engineered with great care. The Noah 76 is one of three models from 70 to 88 feet in the series. 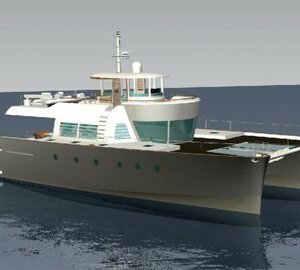 Like the Noah 70 and the Noah 88, she is available in 2 accommodation versions, with the possibility of personalizing the interior decoration. The owners’ version comprises of a vast and luxurious owners’ suite, two large guest cabins and a crew area. The charter version offers four spacious cabins and two crew cabins. At sea, the multihull Yacht Noah 76 is a powerful, fast and elegant trawler, easy to handle. Built in aluminum, this transoceanic luxury catamaran is large, strong and reassuring. The gull wing bridge deck and the two hulls ensure an exceptional stability. The low draft increases the possibilities of anchorages. Equipped with 2 x 500 HP engines, the Noah 76 promises a good performance. Thanks to her hydrodynamic hulls, her drag is minimal, so is her fuel consumption. Designed for the high sea and long distance cruising, the Noah 76 is very stable and offers a range of more than 3000 miles. 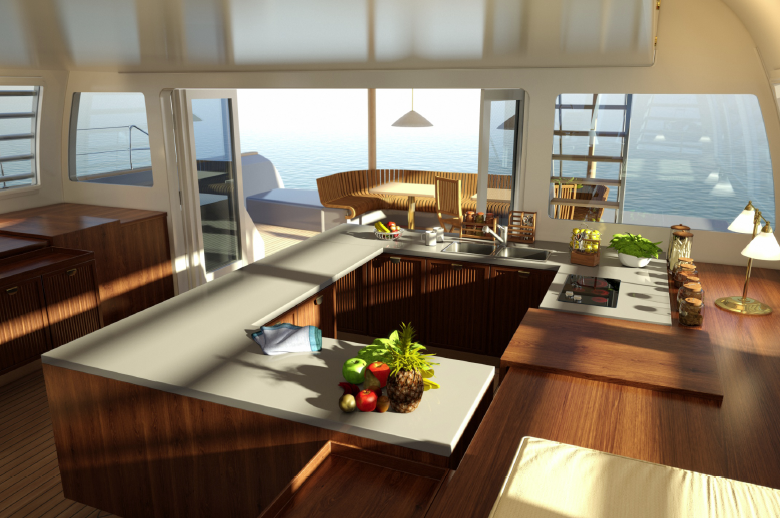 NOAH 76 can accommodate a maximum of 12 guests in 6 cabins. We do have available further amenity, owner and price information for the 23 m (76') yacht NOAH 76, so please enquire for more information. The luxury yacht NOAH 76 displayed on this page is merely informational and she is not necessarily available for yacht charter or for sale, nor is she represented or marketed in anyway by CharterWorld. This web page and the superyacht information contained herein is not contractual. All yacht specifications and informations are displayed in good faith but CharterWorld does not warrant or assume any legal liability or responsibility for the current accuracy, completeness, validity, or usefulness of any superyacht information and/or images displayed. All boat information is subject to change without prior notice and may not be current.